Aren’t they absolutely fetching for a camper trailer? So much fun! My husband agrees! 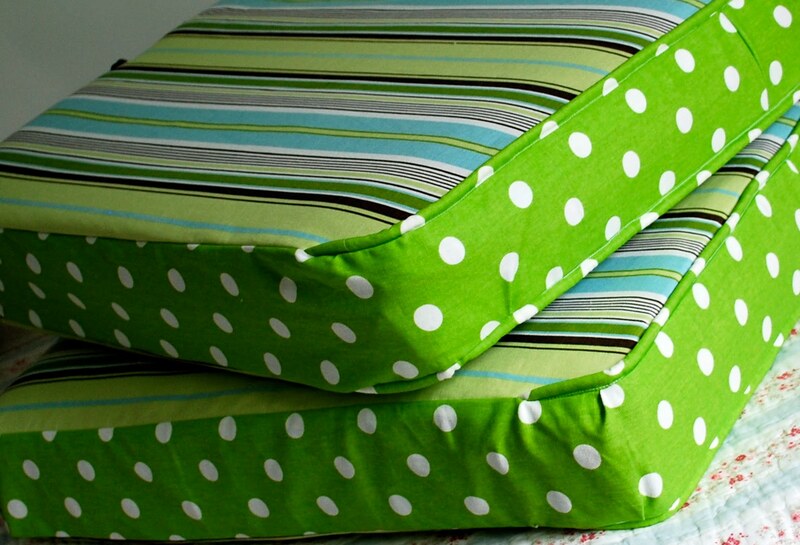 Here’s a tip when sewing cushions: Just do the piping on the front of the cushion. That’s the part you really see and you save a little. See how I came around the corners and just tucked it into the seam? Just do the front on the top and the bottom of the cushion. It looks much more finished! Random Question: Has anyone ever painted Corian countertops? How did it go? Cute cushions! Love the polka dots! I love your blog but have never commented, but I wanted to answer your question about painting corian. I would not do it if I were you. Its a non-porus surface so the likelihood of it holding is about zero. Even if you sanded it, I would think it would have a very hard time every really adhereing and more than likely it would eventually flake off. Sorry 🙁 I'm an Interior Designer and I know how ugly corian can be, but it is a super hard surface and the fact that very little can penetrate it is one reason it has been so widely used. But good luck with it, who knows maybe you can find a super paint out there that can handle it! If anything I would use concrete paint (like the stuff you can paint your garage floor with). Sherwin Williams carries a heavy duty line of it. Again, good luck! Those cushions are so stinkin cute! I now want a camper just so I can fix it up. Looking forward to seeing the finished project. Those are some cute cushions! Now I'm wishing I had some polka dots to go with the stripe fabric I have for mine! very cute. love the dots with the stripes. I forgot to ask you, how did you do the closure in the back? I sewed brown grosgrain ribbon and tied the backs. I'll show more when it's complete! Girl these cushions look amazing! Those cushions are darling. I have been wanting to try some for my window seats and I am just so intimidated. Yours look so fresh and fun. Love them. Thanks for stopping by my blog! Love the cushions! I've never painted corian but my mom painted laminate. She did it in her kitchen and a bathroom. She used a marine varnish. You can get them in various colors but it made the counter more water safe. It worked out well for her. Those are fabulous! Is there a secret to piping? I don't know how to do it! what fun fabric. Love the tip on the piping. I have posted before – just recently found your blog. Your cushions are TDF. I love the polk dot fabric and very clever/unique on how you handled the piping. I have painted countertops too. Just don't use black – it shows the water marks when wet but then dried quickly and aren't noticeable. I have used other colors without any problem. Sorry forgot to edit the above thread. I have not posted before – that's what I get for not reading. Sorry about that! awesome about the piping. Saves time and resources, what could be better. Where is the best price for foam for cushions? I am making a bunch of cushions for both bus/RV Conversion and a boat, inside and out… Or perhaps you have a replacement option that works well?